Publications of the Astronomical Society of Australia (PASA) publishes new and significant research in astronomy and astrophysics. PASA covers a wide range of topics within astronomy, including multi-wavelength observations, theoretical modelling, computational astronomy and visualisation. 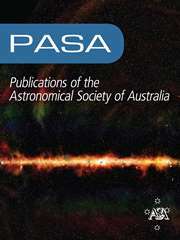 PASA also maintains its heritage of publishing results on southern hemisphere astronomy and on astronomy with Australian facilities.PASA publishes research papers, review papers and special series on topical issues, making use of expert international reviewers and an experienced Editorial Board. As an electronic-only journal, PASA publishes paper by paper, ensuring a rapid publication rate. There are no page charges. PASA's Editorial Board approve a certain number of papers per year to be published Open Access without a publication fee. Cover image: Created by Natasha Hurley-Walker (Curtin / ICRAR) and the GLEAM Team. Please contact Natasha via nhw at icrar.org if you would like to use this image.